The Pour Moi Hotspots Non-Padded Halter Underwired Bikini Top is an ideal underwired halterneck top for women with bigger bust who need comfort and support whilst swimming. In a classic yet contemporary design, special features include ruffles at the neckline, underwired non-padded cups, fully-lined front and a clasps at the back. 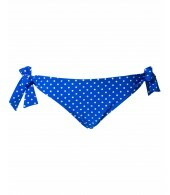 Matching Pour Moi Hotspots Swim Briefs available. The Pour Moi Hotspots Non-Padded Halter Underwired Bikini Top is an ideal underwired halterneck top for women with bigger bust who need comfort and support whilst swimming. In a classic yet contemporary design, special features include ruffles at the neckline, underwired non-padded cups, fully-lined front and a clasps at the back. Matching Pour Moi Hotspots Swim Briefs available. Material content: 80% Polyamide and 20% Elastane. Hand wash only.